Image caption El primer ministro prefirió renunciar antes de ser obligado a hacerlo. Japan's Prime Minister Taro Aso is expected to call a general election after suffering a major defeat in local polls in Tokyo. The Prime Minister has been suffering from dismal approval ratings and open rebellion in his party. Japan's Prime Minister Taro Aso appears to be jumping before he's pushed. According to his office he's agreed with his Liberal Democratic Party and junior coalition partner that a general election will take place on the 30th of August. 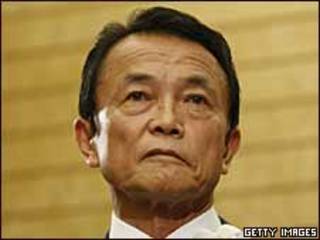 Mr Aso has been facing open rebellion from opponents within his party, who prefer to oust him and face the electorate under a new leader at a later date. On Sunday the governing coalition suffered a major defeat in elections for Tokyo's Metropolitan Assembly. The local poll was widely seen as a test of national opinion. Japan has been racked by a steep recession. The Prime Minister's gaffes and apparent indecision have left him with approval ratings hovering around 20%.